Our friends and family decided to go on this cruise a year in advance. There were 10 of us in total. We all had a BLAST! The food was delicious, the staff were great and very helpful. The port we left from, New York, was not much fun and I would not leave from there again! The lines were long and they don&apos;t seem to care that you have elderly people who can&apos;t stand for that long. I was very nervous about the embarkation, however, it was done well and very organized. The ship was very large, however, I was not a fan of only having one swimming pool for so many guests. We could not get close to the pool all week! I did love the grotto for at least getting wet! The spa, which I booked, was fabulous! We visited 2 specialty restaurants and they were great. We saw one comedian show and it was very funny! The beaches in Bermuda are beautiful and I did like that it was not a tourist trap! BE prepared for a long walk from the ship to anything else, though, which I was not really prepared for. Getting back on the ship from an excursion was not my favorite. It is kind of hectic. We didn&apos;t travel with children, but there were many on the ship. All in all it was a fantastic vacation and I would certainly go on another cruise, hopefully without a hurricane chasing us back to port! Thank you for the memories! 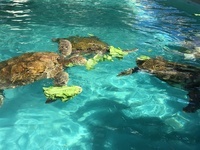 Sea Turtles eating a lunch of lettuce!